Going to the Los Angeles Comic Book & Sci-Fi Convention? I just learned of a convention that is about a one-hour, 20 minute train ride from my home and I’m thinking of going. 700 W. 32nd Street, Los Angeles, Calif.
Across from the USC campus, off of Figueroa Street. Guests listed on the website are for last week’s show. 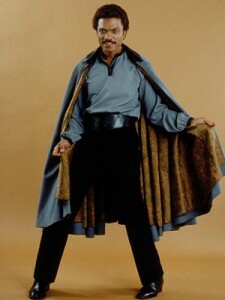 But I’ve heard through the grapevine that Billy Dee Williams will be making a rare convention appearance to meet with fans and sign autographs! As well as reprising his Calrissian roll for Robot Chicken and lending his voice to the forthcoming animated film, Mars Needs Moms. If anyone reading this will be going and will be swinging through the Long Beach, Calif. area, on their way there … can you give me a lift?